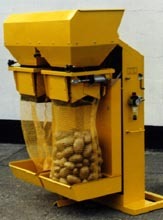 Walthambury weighing and bagging machines manufactured by Morray Engineering offer a great investment for any agricultural or industrial packing operation. From high-throughput packing houses to family farms, growers and packers of any size can benefit from a bagging solution from Morray Engineering's Walthambury Range. 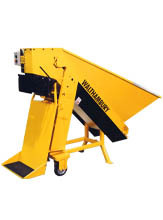 The Walthambury range can handle anything from potatoes and root vegetables to coal and other solid fuels, powders, bark chips, animal feeds, grain- almost any product you can throw at them. Walthambury. The original agricultural weighing, bagging and sack closing systems. With a long history of engineering innovation and a rich tradition of accuracy, reliability and durability these trademark black and yellow machines are the workhorses of packing houses across the nation and the globe. From simple manual bagging applications to complete packing house installations Morray Engineering's Walthambury range is the perfect choice. 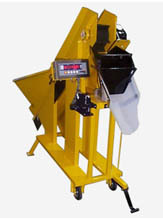 The M180 is a simple, light weight bagging machine designed for low throughput manual bagging operations. Cost effective and versatile the M180 has a range of quick release attachments for various bag sizes and filling applications. Twin belt unit with main and trickle feed for optimum accuracy. Final bag weight ‘top-up' by unique clutch mechanism. Light-weight chassis allowing for a mobile weighing and bagging platform. Similar to the M180, the M220 offers a higher throughput while retaining the simple design of its smaller brother. Up to 220 bags hr. 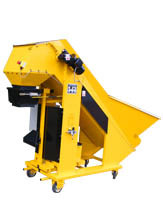 M220 is a gross weigher for bulky products such as horse feed, peat or compost. 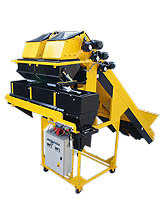 The twin head M520 and triple head M530 are a simple and effective method of bagging root vegetables in the field. Relying on only an air compressor driven off the main drive shaft of the harvester to operate. 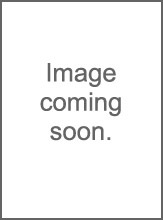 The M520 and M530 are designed to integrate into existing mobile harvesting platforms. Suitable for 25kg weighments into paper and hessian bags. All contact parts rubber lined for complete product protection. Morray NP7 fixed head and portable stitchers for bag sealing. The M350 Pre-Pack (or PP) unit is designed to meet the needs of the low volume pre-packing operation. 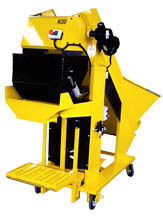 Unique front discharge weigh hopper system for fast cycling. Pneumatically assisted trickle feed system, offers rapid and simple adjustment for varying products. Quick release pneumatic bag clamps for all types of open mouthed sacks. 10 - 50kg weight range. Optional 5 - 25kg range. Complete product protection, all contact parts are rubber or Perplas lined - depending on the product. Optional stainless steel for food quality standards. Incorporating all the best features of its predecessor the M320, the M425 offers 30%higher throughput than the M320. It also represents a cost effective, single station, high throughput bagging solution. Chassis construction eliminates soil build up on the weighing mechanism. Spigoted clamp assembly for rapid bag size change over. Range of cleated belts for different products. Up to 425 bags/hr depending on product and bag size. 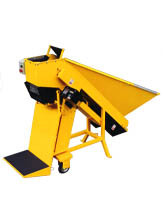 Based on the well proven principles of the Morray range of bagging and weighing systems the M320/11 has been designed to cope with a wide range of free flowing substances such as grain, sugar, salts and other industrial materials.It can be fed directly from an overhead bulk hopper or constant supply source and will weigh into paper, plastic and hessian sacks at up to 320 bags per hour between 10 and 50kg. Internal trickle feed hopper for optimum accuracy. Modular construction to customer requirements. Up to 320 bags/hr depending on product and bag size. Pneumatic operation for hazardous conditions. Variable speed control feed belt to optimize throughput. 320/18V - Volumetric version - 10 -100 liters, for peat, compost bark, bio-humus and other fibrous material. Possing action settles material in bag. Up to 500 bag/ hour depending on product and bag size. Alternative angle elevator system with V form troughed belt. Fast, reliable range of bagging units for use with cartons, boxes and a wide range of different size/type bags. Complete product protection, all contact parts are rubber or Perplas lined- depending on product. Optional stainless steel for food quality or aggressive material requirements. Developed from the successful M320 gross weighers, the M300 net weighers offer increased throughput with one man operation and more manageable control when filling polypropylene woven, hessian or jute sacks. Up to 300 bags/hr depending on product and bag size. Dual weigh bin for 10kg weighments. PTFE liners for reduced dirt build up in weigh bin. Wide range of cleated belts to handle different products. Developed from the highly successful M720 packing system the M550 incorporates reliable and proven features giving the most cost effective performance for a machine with throughputs of up to 550 25kg bags per hour. 550 bags/hr at 10-50kg (625 bags/hr max. at 10kg weighment). Up to 550 bags/hr depending on product and bag size. Reversible cross conveyor to allow filling at either end into bags, trays, boxes, etc. The M720 bagging machine is designed to give extremely high throughput whilst remaining while remaining cost effective and simple to operate. 720 bags/hr at 10-50kg (1000 bags/hr max at 10kg weighment). 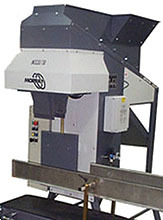 The M1200 High Speed Bagging Machine is Morray's next generation of bagging machine. Fully integrated filling and sealing platform. Can fill bags from 5kg to 40kg. High output, up to 18 bags per minute. 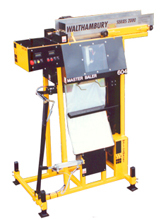 Reliable integrated heat sealer for plastic bags or stitcher for paper bags. Touchscreen interface with simple intuitive controls as well as in depth adjustment for more advanced users. Can handle anything you throw at it! Wet and sticky sands, aggregates, animal feeds, grain, compost, wood chips, top soil and many more products. Volumetric or electronic gravimetric weighing systems available. Outfeed Metal detector with reject system to detect ferrous contaminants. Bulk hopper and feed conveyor. Access walkway for easy maintenance and cleaning. 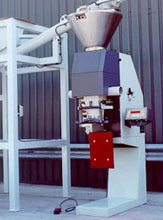 Dust extraction for powdery products. Customized touchscreen with branding, company colors etc. Designed to provide a consistent and gentle automatic means of packing and counting smaller pre-packs into paper, plastic or net outers. 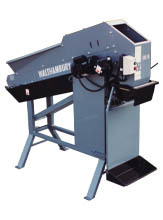 The patented Walthambury Master Balers provide unique cost saving solutions to the hitherto lab our intensive end of line packing operations. M602 - Paper & plastic bags. 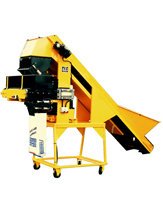 M604 - Wicketted plastic & paper bags & integral Auto Sack Placer. M602 Collator operating with a WASP and STC with NP7 Stitcher. Unique patented pack lowering system avoids damage & jumbled packs. PLC controlled for fast reliable operation. Instant change over to automatic packing combinations. High Output, up to 80 pre-packs on wicketed plastic bags.